a few clowns short: Come what May. Now it’s June. Come what May. Now it’s June. Wow it is June. The arrow of time keeps flying into the future as it always has. 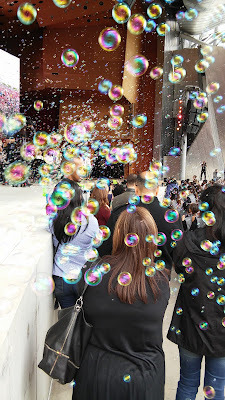 This past May, I enjoyed a live musical, a piano recital, and this big performance of Chicago school kids at Millennial Park which included bubble machines. 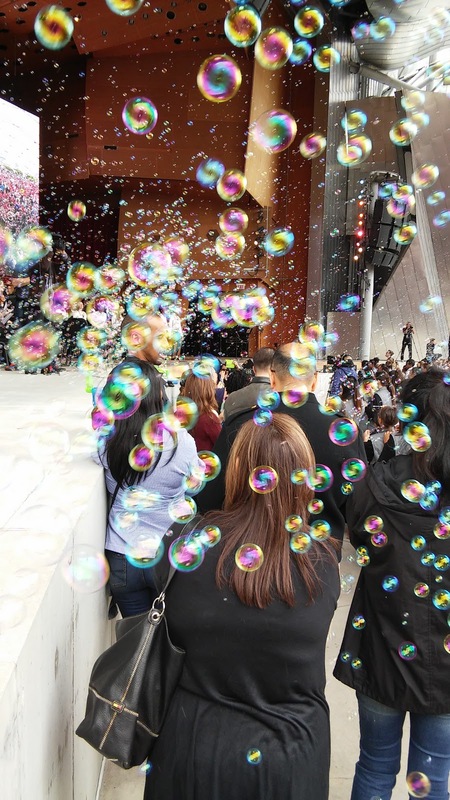 Who doesn't enjoy bubbles? Well you may have noticed it was fifty years ago on June 1 that the Sgt. Pepper's Lonely Hearts Club Band album was released. I was 14. Doing the simple math and you'll calculate that I'm 64 now (another great song from this album). Described by Rolling Stone magazine as “The most important rock & roll album ever made…”. I don't know about that but I do enjoy the album. After watching a the PBS special last night and reading the various analysis on the internet, I'm more appreciative of it's ground breaking studio work. I dug out our old copy of the album. 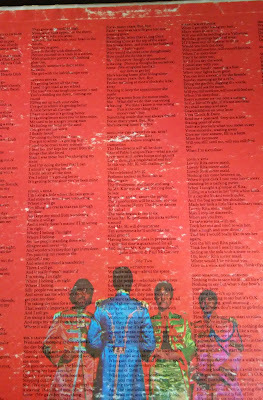 Here's a pic of the back of the album cover (yeah yeah the front cover was astounding but not as useful). You'll see the lyrics to all the songs. 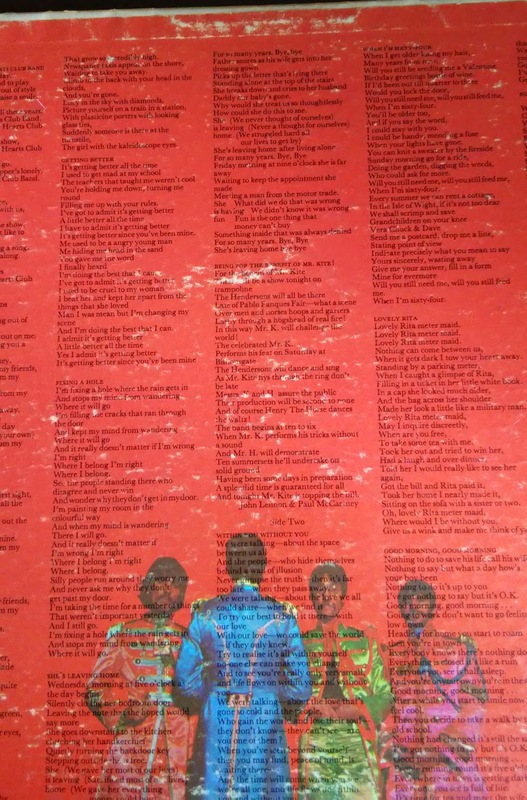 Having the lyrics was a big benefit of albums. I'm using the first lines of the songs on the album as prompts for this post. Thanks John Lennon and Paul McCartney for your great song writing. "A little help from my friends..."
We all can use a little help at times. "Picture yourself in a boat on a river..."
Oh a good float down a river would be great. I have fond memories of tubing on rivers. "It’s getting better all the time..."
Good to think positive. Yeah it's getting better all the time, I'm just not sure what it is. "I’m fixing a hole where the rain gets in..."
This could be about house repairs but it's not. Today it seems political to me but so does so many things these days. "Wednesday morning at five o’clock as the day begins..."
I'm not a morning person so if she was leaving home at this time of day I probably would not notice. Actually, we have noticed that she has returned. Now we are wondering when she will be leaving home again. Someone with more talent than me should write a version for the new boomerang kids. "For the benefit of Mr. Kite..."
Always thought this one was very odd. While watching the PBS special about the album I learned it was based on an old poster John bought in an antique shop. "We were talking - about the space between us all..."
IMHO - this is the strangest song of the album. The Indian music influence on George Harrison can't be missed here. Great song for yoga. "When I get older losing my hair..."
Thank goodness not! I'm 64 with a full head of hair. I'm still getting feed at 64 too. There's a meter maid in our family history and that's all I'm saying about that. "Nothing to do to save his life call his wife in..."
Ok, I would not recognize this song from it's first line. The repeating "good morning good morning" parts are more memorable. "I've got nothing to say but it's ok..." The lyrics match up with today's social media description. "We’re Sergeant Pepper’s Lonely Hearts Club Band..."
The reprise of the first song. IMHO it would have been better to include another new song instead of basically repeating. "I read the news today oh boy..."
1967 or 2017 - the news of the day is typically not good. No news is good news? A splendid time is guaranteed for all in the comment section. Hey Jude, Get Back you Day Tripper. Yesterday, Lady Madonna commented about A Hard Day’s Night.